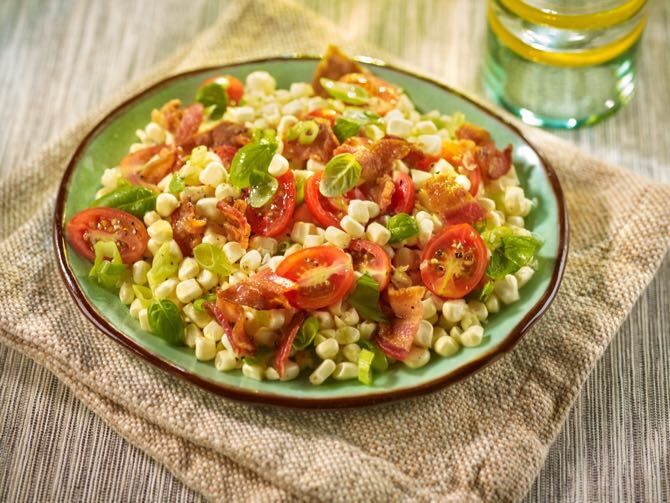 Fresh, savory and smoky-sweet this simple salad is a great compliment to grilled dishes. In a small sauté pan cook bacon until crisp. With a slotted spoon remove to paper towel to drain, and reserve. Shear off the corn kernels with a serrated knife over a bowl. Toss in the tomatoes, scallions,vinegar, and oil. Just before serving tear basil leaves and add to mixture. Warm bacon and toss in.